The number of people missing after Typhoon Bopha struck the southern Philippines has risen to more than 800, with 620 confirmed dead. The number of missing had risen dramatically because contact was lost with 300 fishermen at sea, Civil Defence chief Benito Ramos said. 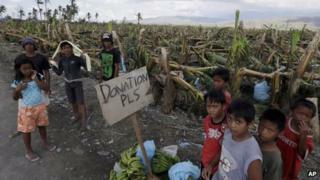 Rescuers are continuing to search parts of Mindanao island devastated by the typhoon on Tuesday. Bopha is due to return, in a much-weakened state, later on Sunday. Storm alerts have been issued for provinces in the northern island of Luzon. President Benigno Aquino has declared a state of national calamity, which should allow officials to control the basic price of commodities and enable local governments to access funds for relief efforts. Japan, the United States, Australia and Canada have all pledged to give aid. Mindanao's two eastern provinces, Compostela Valley and Davao Oriental, were the worst hit by the high winds and heavy rain brought by Typhoon Bopha. More than 300,000 people were forced into evacuation centres. Food and water is becoming hard to come by and there have been reports of looting in some areas. Families were lined up along roadsides in Compostela Valley holding up signs asking for food. "Have mercy on us, please donate," read one sign held up by some children. A UN aid assessment team found 100% destruction" upon its arrival in Mindanao, said spokeswoman Imogen Wall, who warned that civilians there will "need a lot of help" for a long time. "This is a very poor area where everyone is dependent on agriculture. If people can't earn money from crops they won't be able to put food on the table for their families," she told the AFP. The National Disaster Risk Reduction and Management Council said on Sunday that the death toll now stood at 620, nearly 1,500 had been injured and 817 were missing. Civil Defence chief Benito Ramos said that the number of missing - which stood at nearly 400 on Friday - had more than doubled because some 300 fishermen had been added to the list. The fishermen were last heard from as they headed towards the Spratly Islands in the South China Sea before the typhoon struck, he said. But although they have been declared missing, a search has been launched for them in case they found refuge on the islands but had been unable to make contact with their base back in the Philippines, he added.